Go on a magical journey with the Unicorn Cycle Ride On! Kids just move up and down with their feet on the pedals to ride this unique Unicorn. There’s no need for batteries or power: just rise and fall in the saddle to move the Unicorn’s legs and head forward, creating a galloping motion that propels the Unicorn Cycle forward. Use the handles on either side of the head to guide the Unicorn in the right direction. The Unicorn Cycle is a fun new way to improve balance and co-ordination and get kids active. Wooden handles provide the rider with extra stability and security, as well as adding a traditional feel to a revolutionary horse. The Unicorn Cycle Ride On features a red faux leather seat and a faux leather harness. 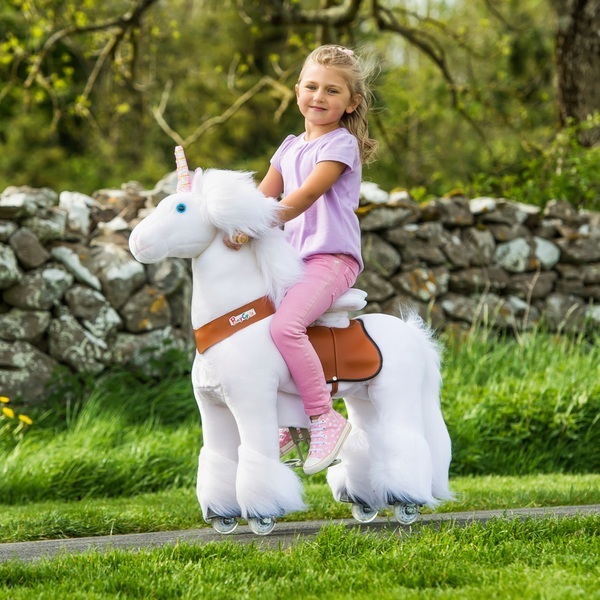 High quality plush fabrics in white and a metallic finish unicorn horn give this ride on a magical finish. The mane and tail are brushable, so kids can groom and care for the Unicorn during imaginative play. The 4 easy-glide wheels make the Unicorn Cycle Ride On suitale for both indoor and outdoor use on flat ground. You can race ahead of the stationary rocking horses with Unicorn Cycle.